Reliance Precision are delighted to have been presented with the Examiner Business Award for Employer of the Year. The category, sponsored by Kirklees Stadium Development, offered tough competition from a selection of Huddersfield’s best businesses. 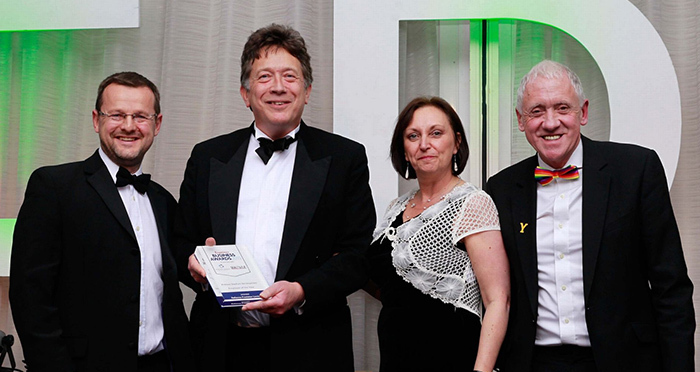 “This award recognises how companies manage and develop the people that work for them. We are therefore particularly pleased to have won it in recognition of our apprentice training programme but also because of the importance we give to the development of all the people who work at Reliance”. The award comes at an exciting time for Reliance who celebrate their centenary in 2020. The title of Employer of the Year reflects the company’s dedication to developing the next generation of specialist engineers through its popular apprenticeship scheme. Reliance employs a predominantly local workforce and currently have 17 apprentices, the majority of whom are from the Huddersfield area. They benefit from attending Reliance’s independently accredited training school which maintains close links with Kirklees College. Reliance believe that integrating apprentice training with operational activities is an intrinsic part of the learning process. As well as learning core skills in the on-site training school, Reliance apprentices work alongside their more experienced colleagues, many of whom were apprentices themselves. “Reliance is committed to providing what we believe is a world-class apprenticeship scheme. We have recently increased our investment in the programme taking on more apprentices than ever before. We consider our apprentices to be the foundation of the company’s future. It is imperative that we pass on essential skills and knowledge to ensure the continued success of Reliance Precision as a specialist engineering company”.